One of my wife’s favorite places to eat, before we went plant-based that is, was Panda Express. There’s something about that greasy, deep-fried, Chinese Takeout that tastes SO good! 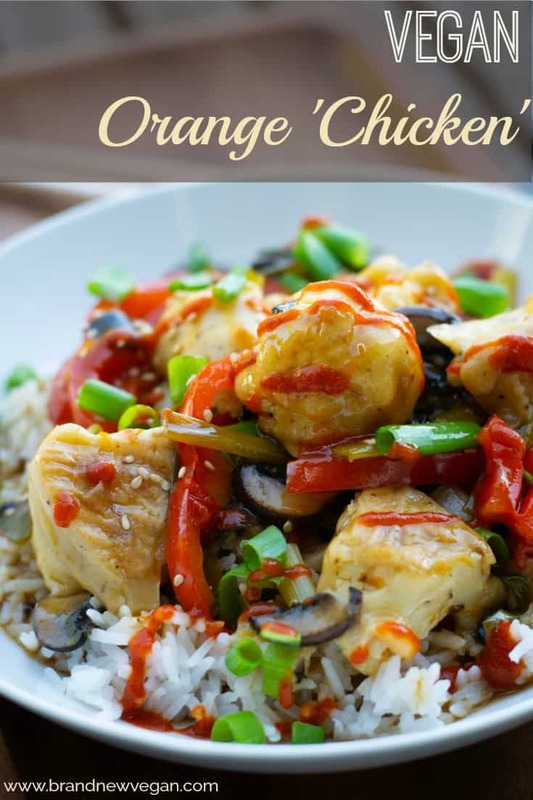 While I usually went for the spicer Kung Pao or Schezwan dishes, my wife’s favorite was always Orange Chicken. 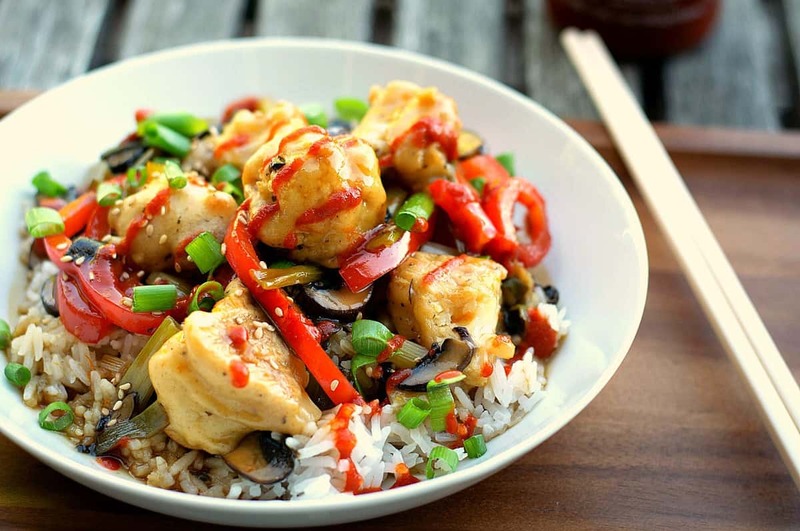 So as I was headed to the grocery store one night, I passed a brand new Panda Express and thought, “I wonder if I could make a healthier version of Orange Chicken, using something else besides chicken”? Well, the answer is definitely yes !!! And let me tell you this is WAY BETTER than the original! And a homemade Orange Sauce that is out of this world! Did I mention no oil? Now I’m not a huge cauliflower fan – never have been. I think it’s a texture thing. But THIS! This was amazing! And with that Sauce? Psssssssh…. Get ready to treat yourselves, you’re really going to like this one. The Cauliflower in this recipe is so easy to make. I was surprised at how good they were! Simply make a batter of flour, almond milk, and some seasoning, and roll your cauliflower bites around in it until they’re completely smothered. Then line them up on a parchment lined baking sheet and bake for 20 minutes at 450 degrees. Seriously how easy was that? While they’re happily baking away there’s plenty of time to make the sauce. We’re going to add the following ingredients to a medium-sized saucepan. Vegetable Broth, Rice Wine Vinegar, Soy Sauce, Orange Juice, Orange Zest, Garlic Powder, Ground Ginger, and Sugar. Everyday ingredients we all probably have in our pantry, but when combined make the most amazing Orange Sauce you’ve ever tasted. To zest an Orange, simply wash an unwaxed orange really well and then take your favorite grater and grate about a teaspoon of the orange part of the peel. Make sure you stop when you get down to the white pithy part – it’s usually really bitter. Now there is sugar in this sauce – so for those of you who try to watch your sugar intake, you could try a substitute although your results will probably vary. You could also try to add the sugar a tablespoon at a time until you find just the right level of sweetness for you. Once your sauce has started simmering, add your arrowroot powder (or cornstarch) to some COLD water and make a slurry. Add this to your sauce to thicken. One of my readers corrected me in a past recipe and mentioned cornstarch works better in COLD water – and he was right. So thank you for the tip! Once your sauce and cauliflower are done, simply prepare your rice, and start stir frying a package of White Button Mushrooms. I added a clove of garlic and a splash of veggie broth to keep things from sticking. Once they started to release their own liquid I tossed in some red bell pepper rings and chopped green onions for garnish. That’s one of the questions I get asked a lot when people discover I avoid oil. How do you stir-fry without oil? Easy! Just use veggie broth, or water, or wine, or just about any liquid you want! The trick is use just enough so that your veggies won’t stick. Many veggies (like mushrooms) have a high water content so they’ll release their own liquid as they’re cooking. Just keep things moving around and you won’t have a problem. Once the veggies are softened it’s time to add in you cauliflower bites and the sauce. Give it a good stir so everything is coated in the sauce and then let it simmer a minute or two until it’s heated through. 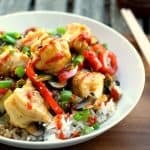 A Vegan Orange Chicken Stir-Fry that tastes just like Panda Express only using Baked Cauliflower Bites instead. Completely Vegan and Fat-Free. Wash and cut a small head of cauliflower into bite-sized chunks. Place all sauce ingredients except arrowroot and water in a medium-sized saucepan and bring to a simmer. 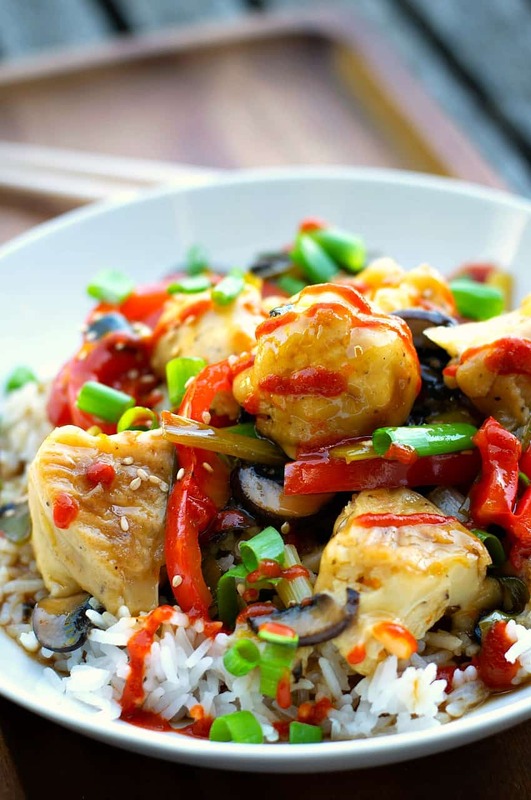 When the cauliflower pieces are baked, stir them into the stir-fry and add sauce. Stir well until everything is completely coated and simmer for a few minutes until heated through. This sounds easy and delicious but there are no measurements for the ingredients. Can you add them please? The measurements are in the actual recipe. thanks so much! I can’t wait to make it and TASTE it! This looks fab Chuck! Can’t wait to try it! Just made it and it was a hit! I think I might double the sauce next time though, wasn’t quite enough for us. We made this last night and will certainly make it again! I’ll probably thin the batter a bit as it was pretty doughy, and we added a second pepper as we didn’t have mushrooms on hand, – it was good! The heat lovers added some Sriracha. We did double the sauce and I’m very glad we did. While the husband certainly liked it, he wasn’t impressed with the dirty pans total as he does the cleanup! I used parchment paper for the cauliflower so no cleanup there. ..then just 1 pan for the sauce and a wok…shouldn’t have been too bad? I know this answer is a little old, but! I wondered the same thing because I tend to be a “read the package and obey all the rules” person. However, I looked it up and there is a lot of information that says parchment paper can be safely used at 450 degrees and even up to 500 if you are only baking for 20 minutes or so. It will just turn dark and brittle after that, but isn’t “unsafe.” And this info came directly from the manufacturers. My son thought there was too much orange, too. I think I”ll decrease the orange zest by 1/2 next time. I really enjoyed the recipe, though. I was amazed I was eating cauliflower! Hey Chuck! Do you think that the cauliflower would work in the slow-cooker instead of the oven, so it can cook while I am at work? Thanks! I have never done it that way – so I’m not entirely sure. Will it brown in a slow cooker? The whole idea for the batter is to bake it into crispy little cauliflower bites – not sure a slow cooker will do that. But hey – can’t hurt to try it though? This was amazing. I really loved how easy the clean up was given the stagger you can build in between the separate components. Eating this now. Man the flavors! I’d probably cut back on the sugar and add a little red pepper flakes next time, and it’s really important to get a good crisp on the cauliflower. Thanks for this! Delicious! Any tips to make sure the cauliflower gets crisp? You can dredge it in panko crumbs before baking. I would also broil it for a couple of minutes to ensure a good crisp! Oh, YUM! You’ve outdone yourself again, Chuck! This was the best thing I have had in a long time. Wow! My husband and I loved this! Thank you so much. We had this tonight. Very delicious! I only used half of the white sugar you called for (1/8 c.) and it was plenty sweet for us. Thanks! Can the sauce be made ahead? If so how many days in advance would be ok? I would like to make it tonight (Tuesday) and serve it this Saturday. Thanks! I think it would be ok. It’s Veg Broth and some spices, so would keep for a few days. I would give it a good mixing before using it though. We just did a version of this: the cauliflower per this recipe, but another orange sauce (that we’ve done before with chicken), served with broccoli. Turned out so good! The consistency and the taste of the cauliflower is amazing: if you would have told me it was chicken I would have believed you. Made this last night Chuck, and it was awesome! Thanks for a great recipe!! Hey Chuck… as a brand new vegan I’m very curious why we, as vegans, continue to try and name our dishes after their carnivorous origin? It perplexes me…for example I’ve noticed lots of ‘pulled pork’ sandwiches made out of jackfruit lately, ‘tuna sandwiches’ made out of chickpea etc. I’m trying hard to encourage my family and friends to embrace more plant based choices but I’m finding it sets us up for failure when I tell my family ‘chicken’ and it’s cauliflower. It will never perfectly match the animal protein. Curious about your thoughts on this? It’s primarily for familiarity. 🙂 Most vegans grew up as carnists and even though we become more compassionate individuals and want to leave behind our contributions to genocide and environmental devastation, we often also miss old favorites like pulled pork sandwiches, burgers, macaroni and cheese, donuts, etc. And it’s not only for us when we’re feeling nostalgic or craving old flavors and textures: it’s also appealing for carnists! Even if they don’t get the ethical or environmental reasons for going vegan, if they see that they can still eat the foods they like while being generally healthier their interest is usually piqued. Made this last night and it was really good but not quite enough orange flavor for my taste. I’m wondering if the 1/2 cup of veg broth in the sauce could be replaced with orange juice? Making this tonight as it sounds delish! Do you know if I can substitute spelt flour for regular flour. Don’t want to change it and have it screw up the recipe. Part of the appeal is to have crispy nuggets! Amazing recipe – THANK YOU! Will certainly make it again. The only disappointment – the cauliflower sticking to the parchment paper. Orange chicken was also my favorite before going vegan. This recipe is absolutely delicious!! It helps that my wife is an excellent cook! Your recipes are revolutionizing our meals!! Thanks!! Easy and delicious. I changed the sauce ingredients a bit, reducing to 1 T brown sugar, adding 2T agave, and omitting ths sugar. I used more than 2T orange juice since I juiced half the orange. Used garbanzo bean flour (GF) for the cauliflower. Braggs liquid amino for the soy sauce. Next time I plan on adding those little red dried chilies. This was my first recipe from Brand New Vegan and I am certainly going to try more of them. Thanks for a great meal Chuck. My husband, is having a hard time with this way of eating and many of the meals I make get an “It’s o.k” kind of reaction. But this one he loved. I followed it pretty much as written except I added some coconut amino s and a bit of sriracha sauce to the flour mixture. It was fantastic. I might double the sauce next time ’cause we’re greedy that way. I made this tonight — we loved it. I overcooked the cauliflower, which was good and bad — the cauliflower didn’t have much texture because it was so done (that’s the bad, although I kind of liked it that way), but the edges where it was especially done were very chewy after they got mixed in with the veggies and sauce. That was really good. One thing I did to make it easier — instead of dipping the florets in the batter, I just dumped all of them in and stirred until they were all coated. Worked great! Thanks for another winner! I reduced the recipe to two servings. Very good, but a tad too sour. I’m going to replace the red wine vinegar with catsup so it leans more to sweet than sour. And then I will double the sauce as one of the comments suggested. Be sure to remind people that the cauliflower have to be a good distance from each other on the parchment; they like each other! Only a few of mine stuck together, and they could have been a bit darker, so 30 minutes next time. Overall though, a great recipe! Thanks Chuck! This was so good but when I make it again (and I will) I will reduce the sugar in the sauce, It was a little too sweet for my taste. Other than that it was soooooo good. Not sure if my last comment made it – very good just a little too sweet for me. I will reduce the sugar when I make this next time. WOW! like one of the prior posters, if you’d have told me this was chicken, I’d have believed you! This was SO good. 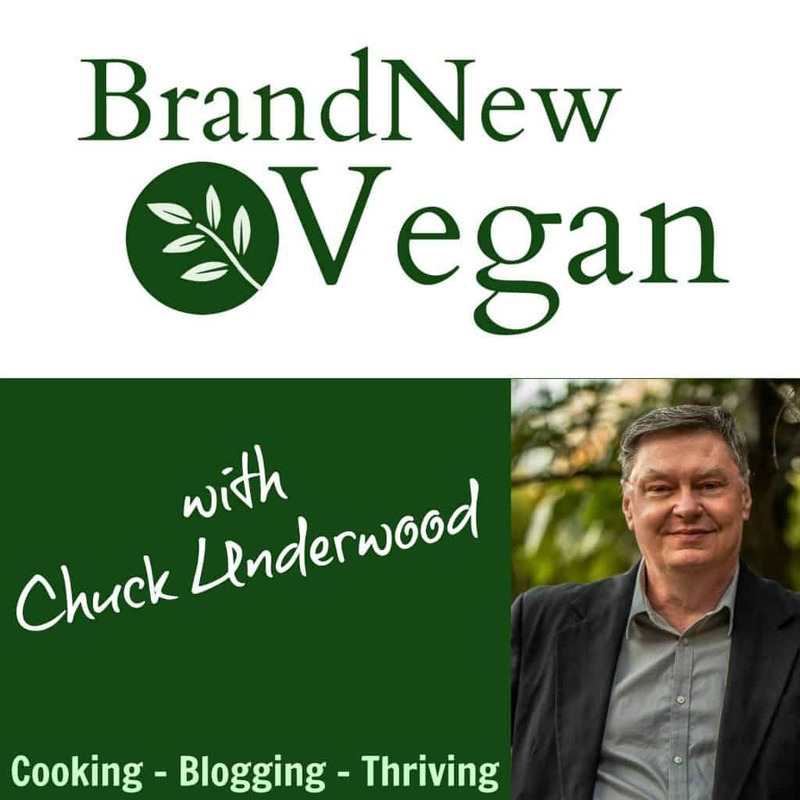 Thanks Chuck – so glad I found your site! Chuck, I don’t know what took me so long to try this one. So many wonderful reviews and I just now made your Vegan Orange Chicken/Cauliflower. When I used to get Chinese in a restaurant, I got spicy and hot. So, this was a pleasant surprise to say the least! I cut the recipe in half and mane 3/4 of the sauce. It was just enough. ( I did add 1 teaspoon of chili garlic sauce) A wonderful treat. It’ll be on my menu often now! Thanks so much! I couldn’t get into the cauliflower, although I probably overcooked it trying to get it crisp. Definitely going to try this with tofu instead. Loved the sauce! I used this recipe for the sauce. I didn’t have a few things so I made due and substituted. It was amazing and easier than the what the actual recipe calls for. Instead of broth I used water. Instead of the maple syrup, orange juice, and orange zest I used just over 1/4 cup of orange marmalade. Delicious.